The word Waheguru pronounced vaaheguru is made up of two words “wah(e)” and “guru”. The word “wah” or “wah(e)” is an ecstatic expression of and wonder. The word guru is a combination of two words “Gu” meaning darkness and “Ru” meaning light. The Guru thus means one who removes darkness by bringing in light. Wahiguru is Guru-mantra, whose recitation erases egotism. A Vichar on the purpose of Gurumantra has to be done by the Sikh so as to know the essence of its meaning which is gradually understood. This enables the Sikh to have proper state of mind and direction during Waheguru Simran. So how can you become pure and the veil of illusion be torn away? The world that we live in has come about because of Hukam ,and so do we. Whatever happens is because of Hukam but the illusion is such that everything is seen as separately existing. We also live the life with a separate self-identity which is known as haume . This illusion of separateness in spiritual circles is known as duality. We thus have to SEE the working of underlying Hukam( HIS command ) in the world we live in in everything. We have to live a life of acceptance of whatever is happening (detachment) rather than in resistance - when we either like or do not like what is happening around. Life of “Hukam Rajai” is to live life with inner anand. The up and downs do not affect. This is the stage where we are in Oneness with the creator. BELOVED FRIEND, my BELOVED FRIEND - standing so near to me is my BELOVED FRIEND! Now is Known, the unseen Lord has come to be known ;(I ) now know the Lord ! The one who is not seen, is within each and every heart sleeping (meaning not awake in our consciousness) is the sweetest ambrosial nectar. HE is with all, and cannot be separated; the fool does not know HIS taste (of nectar). giving in to the illusion, he cannot meet the Lord. The illusion is strong, very strong. All our focus is outward towards the world. This world exists, no doubt but the underlying reality is of transitory nature and the wonder that is creation and its working ever eludes us. The reality thus remains hidden from our senses and the mind. The nature of the mind is such that thoughts ever fill it. These thoughts are interconnected and ever running. These keep us involved and connected with the world day of daily existence. Our mind is outward focused and so is not able to perceive the reality. This focus also keeps us steeped in so many false illusions about the creator and the creation. For the reality to be known our awareness has to be focused inward as well. One who is not SEEN can be known by going within. The Jap of gurumantra is the way to move within. Let us see how. Is the (real ) pilgrimage deep within that is purifying. And in Japji sahebji Guruji has written in length on the importance of “Suniye” – listening and “maniye” – accepting. These “ pauries” are to be read again and again . Listening- (to which one becomes) the Siddhas, the spiritual teachers, the heroic warriors, the yogic masters. Listening- (to which that made) the earth, its support and the Sky. Listening-(to which that made) the oceans, the lands of the world and the nether regions of the underworld. Listening- Death cannot even touch you. Says Nanak, (listening) the devotees are forever in bliss. Listening-(to which that made) Shiva, Brahma and Indra. Listening-(to which) even foul-mouthed people praise Him. Listening-(to which is like having the) the technology of Yoga and knowing the secrets of the body. Listening-(to which is like knowing the) the Shastras, the Simritees and the Vedas. Listening-(to which one receives) truth, contentment and spiritual wisdom. Listening-(to which is like having) cleansing bath at the sixty-eight places of pilgrimage. Listening-( to which and ) reading and reciting, honor is obtained. Listening-(to that from which) one achieves peaceful meditative state. Listening- (to which one has access to) the ocean of virtue. Listening- (to which one equals) the Sheikh, religious scholars and emperor. Listening-(to which) even the blind find the Path. Listening-(to which) the Unreachable comes within grasp. What is that which Guruji has asked us to listen to? We are to listen to the word “Waheguru” which is Guru mantra with a connection to our mool (origin) and shabad within. We are to listen to Gurbani which is Shabad Roop. We are to listen to panch shabad within that made the five elements that makes up the material world. We are to listen to Anhad Shabad within that comes from the Nirankar and created the Braham roop world. So the Jap of “Waheguru” the gurumantra is the way to break the illusion of maya and connect with the MOOL – the origin . Amrit-vela ( the early morning hour before 6.00 clock) is advised for starting this meditation. Do Jap of Gurumantra. Repeat it and listen within to your own voice. This way a certain pull is experience and the awareness begins to remain within. Let the thoughts run as such. If thoughts divert just come back and do the Jap of Waheguru gurumantra by listening to the word again and again. “maniye” – acceptance comes in and becomes important. There are two obstacles which anyone on spiritual path has to face and overcome or they would the bane stopping progress. The first obstacle is “DOUBT” and the other one is “RESISTANCE”. Guru says GOD is near within, the person doubts. Guru says GOD is everywhere in creation, the person doubts. Guru says Jap of Gurumantra is the way to reach the Mool, and the person doubts. The person even doubts the Guru, and questions the outlined path. Our mind is used to material world and its ways. The ritualistic ways of the religion look attractive and are easy to do. We are unaware of how the illusion is being fortified through these attractive spiritual ways. Doing a pilgrimage and bathing on a special day is the spirituality that easily attracts. Asking a Pathi to do Akand path or paying for it is an easy way. Doing path daily without any attempt to really understand and follow the Guru’s stated words gives only an illusion of being spiritual. The list is long. The traps of maya are many. Simply reading Gurbani or listening to kirtan would not work till vichar is done and attempt made so that the mind follows guru’s shown path. The “Resistance” is the second obstacle. We resist change. We resist new ideas. We resist and question why any thing is happening to us. We resist the ways of the world and happening not liked by us. This resistance mode also comes in way of spiritual progress. Resistance as powerfully keeps us in attachment as direct attachment does. The spiritual way requires us to be detached while living in the world. We are in acceptance without any resistance. Thus acceptance – maniye is a state where we agree and also do not resist. We believe and act. We take things as such. We are cool when there is up and we are cool when there is down. We enjoy the life in the world and accpt its ups and down. This state of acceptance is of paramount importance in spiritual life. This ‘Doubt” and “Resistance” can only be overcome, through a state of acceptance. Our mind has to really agree and act on Guru’s words. We have to act on Guru’s words. This agreeing is believing the Guru’s words. This is acceptance and the state of “maniye”. In this state when the Guru says the GOD is near you, we accept as such . We keep accepting such and soon begin to feel that GOD is near. 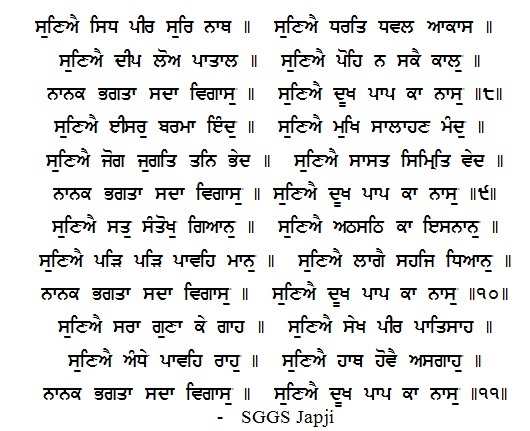 In Japji Sahib the Guruji has written and described the stage a Sikh reaches when throwing aside doubt the guru’s word is believed and accepted by the mind. The state (spiritual) that acceptance brings about cannot be described. No paper, no pen, no scribe can record this state. Such is the Immaculate state of Naam ( the real reality). There are three more pauries (stanzas) about the state that “maniye” (believing) opens up. This is a subtle spiritual step that opens up the door that takes the mind from being solely engrossed in material world oblivious of underlying unseen reality. The unseen reality is Naam , the real reality that is presence of Waheguruji. This real reality is Oneness all around. The connection with this real reality is start of living again in our true home . Can this state be described, it only has to be reached and experienced. The Guruji asserts that believing this unseen reality is the door. This believing is not just intellectual talk which is known but a feeling based connection which is accepted by the mind. To make this point more clear let us look at one quality which is within us – enthusiasm. Presently you may not be feeling this, but just get up and do any work with enthusiasm assuming you are already enthusiastic. Believe and act enthusiastic and you would find that you have become enthusiastic. Do the same with some other quality. You can act very confident and you would find this quality is manifested in reality. Our mind lives in material world so how can it accept the unseen reality not yet manifested. When Guru says (Guru mere sang, sada heh nale ..) is within all along then accept and act as if Guru (shabad) is within and the reality would manifest. The Mool which guru states is the real reality and the gurumantra “Waheguru” is the key that starts the Sikh towards meditation path that connects with the Mool – our origin. This one word is the connecting link. This enables us to repeatedly keep telling our mind the true reality till the mind becomes a believer and lifts its viel that blocks our connection. Let us see how Waheguru Simran connects us with the Mool. The Waheguru Simran is closely connected with the MOOL Mantra. Ek­oaŉkār saṯ nām karṯā purakẖ nirbẖa­o nirvair akāl mūraṯ ajūnī saibẖaŉ gur parsāḏ. Ek-oNkaar - Ek oankaar symbolizes HIM. The EK which means one symbolizes oneness. There is only HE in the entire universe. Everything is HIM including us and the material world. The Ongkar symbolizes HIS created universe. From the formless has come in everything and so is universal consciousness. The created world is a maya – which means it appears real but is not real. One who is not SEEN can be known by going within. The Jap of gurumantra is the way to move within. There is oneness and Waheguru Simran along with Guru’s wisdom leads us to connect with our mool . The Mool mantra guides us in this path. sat naam – Sat means truth. Truth is that which does not change. Eternal Truth is His Name (identity).He is also our real identity. Our individual consciousness is simply HIS consciousness intermingled with (an illusionary) ego – that creates experience of separateness. The created world is also Sat – a place here creator also resides. In fact creation is his another roop. within which dwells the True Lord. this roop of the Lord becomes visible. While doing “Waheguru” Simran SEE Sat-swaroop of Waheguru everywhere and in everything. This roop may not be visible first but is to be accepted as true. Keep doing Simran. Do it daily everywhere and looking at everything. Recite and affirm through Shabads of Gurbani .There are many Shabads in Gurbani which state this truth and are to be recited along with Waheguru Simran. This Simran is Wah! Wah! Wah!.... .This SIMRAN is just “TUHI ! TUHI ! TUHI ! …” observing what is not SEEN but is there. Later having the FEELING of presence. kartaa purakh - He is the Doer of everything. Karta Purakh means that HIS presence is the real creative force. Everything in the world including the physical laws are so because of HIS presence .HE is the real karta ( the doer) the invisible creative force. This force as Shabad roop has created the world . The hukam of the Waheguruji as prevailing in the world is not easily perceived.While doing Waheguru Simran OBSERVE the Hukam. 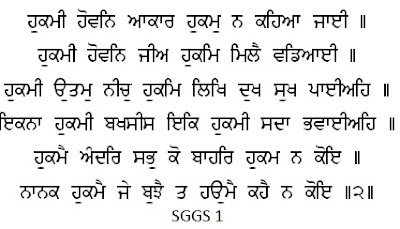 Guru ji has explained so in Japji sahib (the pauri is given above). Hukam is everywhere. All acts have Hukam underlying them. Understanding action of Hukam and seeing it in action is the way to know the creator. The Hukam and Hukmi both co exists. This is the way of Simran. Repeat Waheguru and See the Hukam in play is the way towards being aware of oneness and Seeing the creator Waheguru in Creation. Our mind is not accustomed to this way of looking at creation. The mind sees it self separate with a will and self- identity. So is everything seen in this world – separate and with separate individuality. The world is compartmentalized and so also our individual actions. We are living in a world of contexts. Within the context of this material world we have individuality and individual will. Change the context to prevailing Hukam and our will is also within the Hukam and so also our actions.Do we have a separate will? Answer is yes and no, depending upon the context. An example for understanding is a computer game. The character within acts and there is a corresponding effect. Is not all actions already within the programme whereas visible are only those being played. Same way this world is a world of possibilities and our actions are within the framework connected with our thoughts which are influenced by beliefs created by previous actions and collective consciousness. Just think do we really have an independent will or the will only appears to be independent. In reality our supposedly independent will is fully dependent and influenced by beliefs, circumstances, situations , environmental inputs . It chooses the actions programmed from the possibilities giving illusion of separateness. By Guru's Grace, one who dies while yet alive, understands Hukam. To die while alive means to the attractions of the world. It is living detached. This needs to be elaborated more. First about the nature of the world. The science tells us that further to subatomic or a quantum level the matter is vibration. At subtle level it is energy- an intelligent energy. We live in this world with our awareness focused outward. We are connected with the world with thought, emotions and at subtle level energy links. The five passions ( kama ,krodh ,lobh , moh ,ahankar ) are our ever companions . This is so because the material world is a world of duality. It has love as well as fear. If there is anger so also there is affection. We have desires and needs. How can we come out of this and be in love and peace? How can we become pure and remove the shackles ? Gurujis answer is to live in Hukam and Raza. This way of life gets written as our karma leading to Bhag (good destiny). Raza means acceptance and contentment. It means not to be affected by up and downs of the life and to remain even. This means an understanding of unseen reality. The raza is detachment but not denying or resistance. The world is lived in but without being involved with passions. It is lived with finer qualities of life. It is to live a life of love, confidence, tolerance, peace , helpfulness, sharing , esteem and enthusiasm and with awareness of being jyote swaroope .This state is not achieved through any fight with our mind or resisting the flow of five passions the world brings but through inner connection and Simran. The inner connection comes when awareness is shifted within. Gurbani also calls this state ‘unman’. Listen to jap of gurumantra Waheguru while reciting it till the awareness is pulled within. Keep the focal point of awareness within even when eyes are open and doing chores which are automatic. Keep up the Simran. The Sikh does not fights the minds over its ever movement of thoughts nor tries to still it. 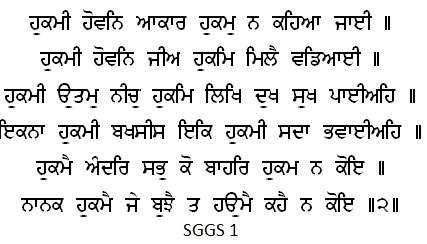 The Sikh instead molds and directs it with jap of Gurbani and Simran. The Sikh does not resist what has happened. The Sikh accepts the happening whether right or wrong and takes further action. The life of the Sikh is not passive (fatalistic) but ethically dynamic. As the Sikh contemplates on Hukam and observes its play the true detachment comes in. With hukam and hukami around how the passions can trouble. When the Word of the Shabad abides one deep within, thirst and desire are quenched. nirbha-o - Without fear. Fear is not a part of HIM. Fear is an illusionary part of creation. A work of maya ( the grand illusion). nirvair - Without vengeance or anger. This again does not symbolize HIM but is maya. These exist in the created world. 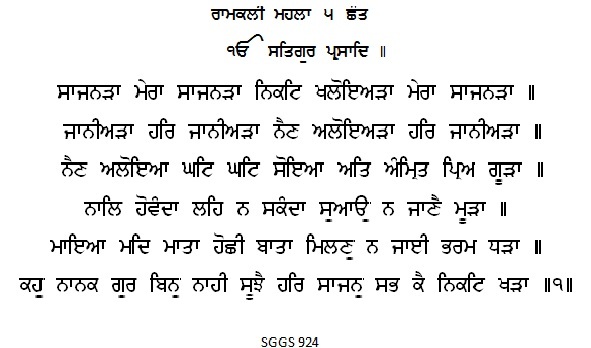 akaal moorat - Undying form (deathless).HE is eternal. Ever same. Has timeless existence. Death is there in the created world. ajoonee - Unborn. Birth and death is in the created word. He is akal – meaning ever living and has not been born. saibhaN - Not begotten, being of His own Being. Saibangh means exists as such and self-created. There is no other only HIM. With the above clarity ,the Sikh can shift away from what is seen in the world. God with human form; as an idol. As an angry revengeful God. God that creates earthquakes and brings untold misery. The Sikh has to be clear about what aspects of God are lurking hidden in the mind. Hukam is impartial. As you sow so you reap. In the later part of Japji Sahib five khands have been described. Khand means a part. These Khands can be described as five aspects of spiritual life which Sikh has to understand to be ‘panch parvan”. These guide the Sikh towards spiritual direction that has to be taken. 1. Dharam Khand :-our earth is a Dharamshal ( a home of Dharma). There is so much varity of living beings on earth. It is the karma done while living that gets written as destiny. As are their deeds and their actions, so are their results. One gets to be chosen through the path of karma only. Life of seva ,sharing and simran are ways towards purity.Listening and Reciting of Gurbani.,Gurbani vichar and effort towards Waheguru Simran are the spiritual karma. These bring result of guru’s grace. 2. Gian Khand:- in this realm of Gian (knowledge) the spiritual wisdom is supreme. This is experiential.The gubani guides towards this wisdom. The Sikh is connected within and hears th e Naad of five elements- the Anhad Shabad.The sikh is aware of the Shabad Guru within. 3. Saram khand :- This is the khand of humility. The Sikh is living in humility (with ego being gradually being relegated in the background).The awareness, intelligence and the mind are reshaped here (hukam is seen prevailing). 4. Karam Khand :- This is where the the life is in tune with the mool. The Sikh lives in awareness and presence of waheguruji. 5. Sach Khand:- This is the abode of Nirankar. The creator that created the limitless universes and is within the creation. The connected Sikhs are bestowed with grace and happiness. Waaho! Waaho! Those humble beings ever praise the Lord, unto whom the Lord Himself grants understanding. Through Jap of Waaho! Waaho!, the mind is purified, and egotism departs from within. gur parsaad. - By the Grace of the Guru, made known to mankind. We are so much in an illusion of separateness and our own identity that HIS knowledge can come only through Guru’s grace. Only a real guru in one with HIM can impart this knowledge and show the path of self- realization - realization and awareness of our true origin. The Guru is ONE with HIM and shows us the path to meet HIM within us where HE then as GURU-GOD (Shabad Guru) guides further to bring in the awareness and Union. All this is a work of grace. The Prasad, that only the Guru gives. The Shabad Guru meets us first in the worgs of Gurbani. The pull of Gurbani takes our awareness within. The path of simran makes us see the prevailing hukam. The Sikhs spiritual knowledge gets perfected through association and vichar of Gurbani. When the Sikh keeps awareness within then the Anhad is heard and so also the guidance of Shabad Guru within. The stage when haume is shed. ego (separate identity) is driven out. Simran refers to remembrance with a purpose to be ONE with Kartar . We are jyote Swarope and have choosen to live in the Physical Body in this Physical World. All being a the creation of Karta. The World is a creation and base Mool is oneness. SATNAAM refers to the duality in creation. Within the creation is SAT which supports the creation and because of SAT the creation exists. This SAT part also is Naam too. Naam is also the way for us to unite with HIM. ਗੁਰਮਤੀ ਹਰਿ ਮੰਨਿ ਵਸਾਇਆ ॥ Through the Guru's Teachings, I enshrine the Lord within my mind. Gurmat is known through gurbani only. Gurbani is what we have to follow to understand and do simran. Gurbani has come from Shabad and so is Shabad Guru in written form. Shabad is within us to and guides. Now SIMRAN is done in the ways the gurbani teaches us. Waheguru gurumantra jap is done to concentrate our mind and go within . It is shifting of awareness. Waheguru simran is done when to remember HIM by seeing HIS HUKAM prevailing in creation. HUKAM creating forms. HUKAM sustaining creation so perfectly.WE do simran when we SEE and FEEL HIM in creation. We do SIMRAN when we do vichar of MOOL Manter. Jap is done of MOOL manter slowly with associated meaning/vichars so that HE dwells in our minds. Simran is not just rote recitation. Simran is doing Path of gurbani with feeling and enshrining meaning within us. We should do path after doing vichar on pangtees by and there after acting as per guru's instruction. Vichar of Gurbani is SIMRAN. Listening to Vichar is Simran. Reading Gurbani Vichar books is Simran. Hope this brief comment would take you towards knowing what simran is. Ask and the Guru within guides or Guru arranges ways to bring guidance.